Proposition 64, or the Adult Use of Marijuana Act (“Prop. 64”), is designed to allow the responsible use of marijuana by adults and establish a strict regulatory system to facilitate the transition to a legal market. Prop. 64 comprehensively addresses both medical and nonmedical use of marijuana, the regulation and licensing of businesses, taxation, revenue allocation and criminal penalties. Proposition 64, or the Adult Use of Marijuana Act ("Prop. 64"), is designed to allow the responsible use of marijuana by adults and establish a strict regulatory system to facilitate the transition to a legal market. Prop. 64 comprehensively addresses both medical and nonmedical use of marijuana, the regulation and licensing of businesses, taxation, revenue allocation and criminal penalties. What does Prop. 64 legalize? Prop. 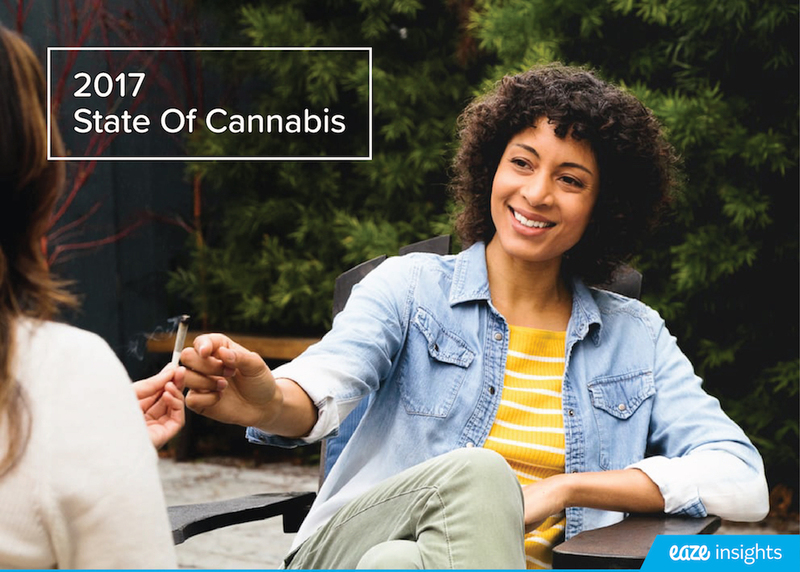 64 authorizes the possession, transport, purchase, consumption and sharing of up to one ounce of marijuana and up to eight grams of marijuana concentrates for adults aged 21 and up. Adults may also grow up to six plants at their household out of public view. How will the adult use of marijuana be regulated? In October 2015, Governor Jerry Brown signed into law a series of bills that together established the first statewide regulatory system for medical marijuana in California. The adult use of nonmedical marijuana will be regulated using the same framework and by the same state agencies provided for in those laws. The Bureau of Marijuana Control will be the centralized office in the Department of Consumer Affairs, with the Departments of Public Health (testing and manufacturing) and Food & Agriculture (cultivation) playing large roles. Supporting roles will be played by other agencies such as the Departments of Fish and Wildlife, Pesticide Regulation, Health Care Services, and the Water Board. What types of licenses will be issued? Prop. 64 provides for 19 different types of licenses- for the cultivation, manufacturing, testing, distribution and retail sale of marijuana-most of which mirror the licenses created by the new medical marijuana laws. Cultivation licenses will be issued for small, medium and large-scale growers. The largest cultivation licenses will not be issued for the first five years and will not allow for vertical integration. Vertical integration-one business operating more than one license category-will be allowed as long as a business possesses a license for each activity. The largest cultivators will not be allowed to vertically integrate. A unique microbusiness license will allow a business to conduct all activities under one license if the business cultivates in an area less than 10,000 square feet. When will California begin issuing licenses? California's Bureau of Marijuana Control will begin issuing licenses on January 1, 2018. To receive a license, an applicant must have been a California resident since January 1, 2015. This restriction will expire in 2019. Licensing authorities will give priority to persons who can demonstrate compliance with the Compassionate Use Act prior to September 1, 2016. An agency may, but is not required to, deny an applicant who has been convicted of an offense that is substantially related to the functions of the business. However, no one will be denied a license solely because they have a prior drug conviction (with the exception of a conviction for trafficking or selling a controlled substance to a minor). Offenses that are substantially related include felony convictions for fraud, embezzlement, deceit, drug trafficking, using a minor in a controlled substances offense, and serious and violent crime. Will cities and counties have any local control? Cities and counties will have the ability to ban all marijuana businesses by passing a city or county ordinance. However, if they do, they will not be able to receive any of the tax revenue from Prop. 64. Cities and counties may choose to require businesses to operate with a local license or permit, but will not be required to do so. Businesses must still comply with other local regulations and rules in order to receive a state license. Cities and counties may also allow for on-site consumption. Cities and counties may ban adults from cultivating outdoors, but they may not ban adults from cultivating up to six plants in an enclosed structure (e.g. a house or a shed or a greenhouse). There will be a 15 percent retail tax on the purchase of medical and nonmedical marijuana, in addition to state and local sales taxes. Cultivators will also have to pay an excise tax on dried flowers ($9.25 per ounce) and leaves ($2.75 per ounce). Cities and counties may establish a separate tax. Will Prop. 64 tax patients? 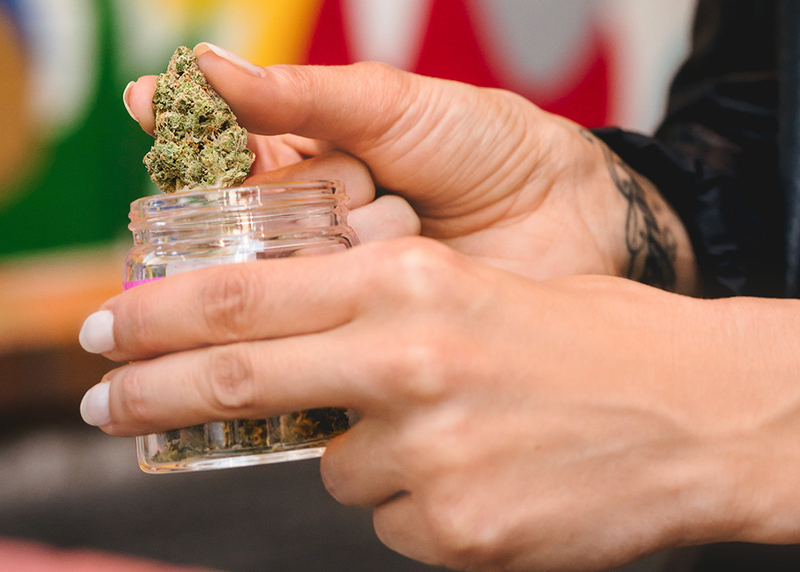 Medical marijuana patients with ID cards will be exempt from state sales tax, but they will still be required to pay the excise tax and any local taxes. Patients currently pay sales tax, but no excise tax. How much money will Prop. 64 generate? The state's independent Legislative Analyst's Office estimates that Prop. 64 will generate up to $1 billion in revenue and up to $100 million in savings annually. The money generated by Prop. 64 will be deposited into the newly created California Marijuana Tax Fund in the state treasury. 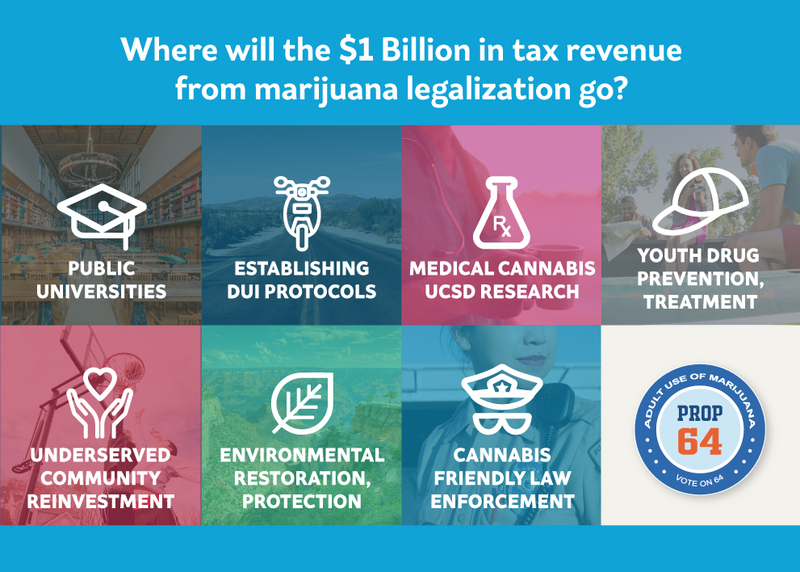 $2 million will be distributed to the UCSD Center for Medicinal Cannabis Research for research on medical marijuana; and $10 million-increasing annually by $10 million for 5 years until it peaks at $50 million-will be distributed to community reinvestment for those disproportionately harmed by the war on drugs. 60% of the remaining funds will go toward youth drug prevention, education and treatment. 20% of the remaining funds will go toward environmental restoration and protection. 20% will go toward state and local law enforcement, but cities and counties that ban businesses or outdoor home cultivation are not eligible for the funds. How does Prop. 64 address criminal penalties? Prop. 64 eliminates or substantially reduces most criminal penalties for marijuana offenses, beyond what is explicitly made legal by Prop. 64. Certain crimes, such as selling marijuana to minors (under 18) and manufacturing marijuana with a volatile substance without a license, will remain felonies. What about prior marijuana convictions? People with prior convictions for marijuana offenses that have been reduced or eliminated by Prop. 64 can petition a court to have their convictions reduced or expunged. This applies to people that are in jail or prison, on probation or parole, or who have already completed their sentence. How will youth be protected? Prop. 64 prohibits the marketing and advertising of marijuana to minors and near schools or youth centers. It also establishes strict packaging and labeling standards, including warning labels and childresistant packaging, to keep marijuana products out of the hands of children. All marijuana offenses will be treated as infractions for minors under the age of 18. They will be sentenced to free drug education, counseling, and/or community service, not jail. All records for marijuana offenses will be destroyed when a minor turns 18. Does Prop. 64 change medical marijuana laws? Prop. 64 builds on the legislative medical marijuana bills, and existing laws such as Prop. 215, to strengthen, not limit, medical marijuana protections. Protections added by Prop. 64 include: new privacy protections for patients; preventing cities and counties from banning the home cultivation of marijuana inside an enclosed structure; exempting patients from state sales tax; and prohibiting the lawful conduct or status of a patient from being the sole basis for restricting parental rights. The regulatory section is amendable by a majority vote of the legislature, as long as it is consistent with the intents and purposes of the initiative. The legislature cannot increase criminal penalties; they can only reduce them further.